What do you do at 7 am on a Friday morning? Do you sit at your table, drinking coffee (yuck! I still haven’t converted to the dark side), eating cereal (oh what luxury!) and reading a newspaper (newspaper…you have newspapers?)? Or have you gone for a run around your neighborhood (probably wearing shorts, you scandalous person!) or maybe are already commuting to work (I bet you drive a car….woww….)? Me? Well, today, you would have found me at our local market, just a five-minute walk from my house. 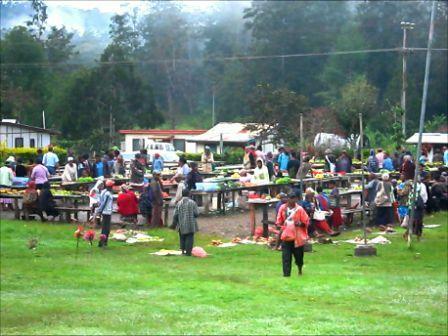 Every Monday, Wednesday, and Friday, from 6-8 am, our national friends gather in one of the best markets in the Eastern Highlands (well, we think so, anyway). Every week, I grab my market bilums (string bags made from sturdy and colorful plastic), some small coins and bills (the sellers don’t often have change), and a pair of good sturdy galoshes (because this is Papua New Guinea and it rains here—a lot...and because "galoshes" makes a much more alliterative title than "mud boots") to purchase the fruits and vegetables we adore for our meals. All of this for less than $9 USD! In fact, our weekly market shopping is where we purchase the bulk of our food for meals. You may have heard how our store has a limited selection or prices are sky-high for imported products… but here, in our market, it’s a produce paradise (and when a hand of bananas is only 50 cents or a fresh pineapple can be purchased for only 1-2 dollars, it’s a pocketbook paradise as well!). As you enter the market, pause for a moment and savor the upcoming feast for your senses—fresh picked flowers line the entranceway, gorgeous wooden carved artifacts and a riot of color and pattern in the dozens of wool bilums (traditional string bags) are scattered in front of sellers on the basketball court, dogs and children race down the dirt-packed floor, darting under tables. Slip past other expatriate customers and begin to wander up and down the aisles, calling out moning! to your national friend standing behind a pile of gleaming tomatoes. Skip the apple—Snow White should have fallen for one of these beauties! Everywhere you look, tables are mounded with heaps of beans (every color imaginable! ), pineapples, strawberries, tomatoes, mangoes, green onions, red onions, capsicum, passion fruit, avocados, lettuce, cabbage, squash, tree tomatoes, pineapples, various kinds of sweet potatoes as well as English potatoes, ginger, carrots, zucchini, cucumbers, raspberries, broccoli, peas, string beans, peanuts, sugarcane, pitpit and other kinds of local greens, various other unidentifiable (but tasty!) fruit …and even hot donuts! I'm walking home from market with yummy veggies! Unlike some markets around the world that echo with vivacious bargaining, animated discussions, and role-playing rejections of over-priced products, this one is quiet, broken only by murmured greetings or soft asking of prices (which aren’t always advertised). In Papua New Guinea, bargaining or examining produce without purchasing are not accepted pastimes, so hone your skills at gauging size, freshness, and ripeness out of the corner of your eye. After a while, pull out your list and begin with your heaviest items (no need to squash the capsicum beneath the pineapple!). Once your list is complete, hoist your bilum (or two) to your head and begin the walk home. (I know it looks uncomfortable, but actually, I find that carrying a heavy load in this traditional manner is actually much easier than trying to haul it home over my shoulder). All that’s left is to start your fruits and veggies soaking in bleach water (don’t forget to set the timer! ), and you can get ready for the rest of your day! And that's how we go grocery shopping in galoshes.